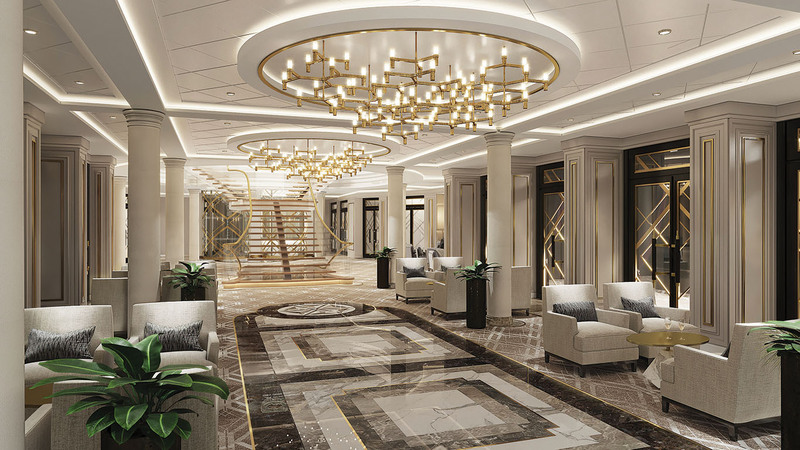 It is fair to say that Regent Seven Seas pretty much set the gold standard in luxury cruise travel with their incredible Seven Seas Explorer. Meaning that the pressure is on for Regent’s next ship, Seven Seas Splendor, to take the luxury experience found on Explorer and somehow make it even better. The early signs certainly are promising. We’ve already shared with you the first details and images from the redesigned suites and living areas. There’s grand staircases, marble bathrooms and enough gold to make Donald Trump hot under the collar. And now, if you can’t wait to be treat like royalty for up to two weeks at a time, early reservations have opened for Seven Seas Splendor’s inaugural season. The first voyage beginning on February 7, 2020 will take guests on an unforgettable 14-night transatlantic journey from Barcelona to Miami. Further itineraries will see Seven Seas Splendor cruise the Panama Canal, a transatlantic crossing with stops along the North American coastline, and the iconic Mediterranean cruise which takes advantage of Splendor’s comparatively small size to reach intimate ports such as Toulon, Palamos and Kotor. “For Seven Seas Splendor’s inaugural season, we included voyages to destinations that are as extraordinary as the ship herself,” said Jason Montague, president and chief executive officer of Regent Seven Seas Cruises. All that’s left to do now is count down the days until 2020 when we’ll find out if Regent can achieve their ultimate goal – to achieve perfection.